My summer holiday started with this Super Duper Really Amazing Fun activity!!!! This was four days activities !! The place that you can learn teamwork. The environment that taught resilience. 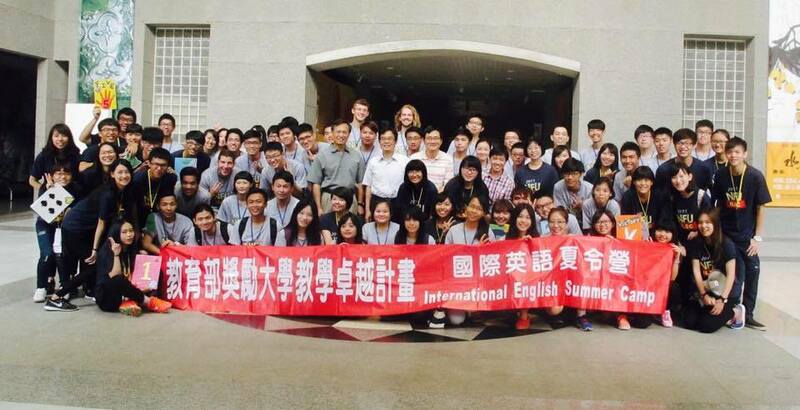 I'd like to introduce you the NFU International Language Summer Camp 2015. This event was held for four days and was attended by five students from the sister schools. They were Adam Bodhi Farnow, Christian Mark Garcia, Austin Tyler Weigle, Dashnyam Tsamba Taij and Tumenkhuslen Otgonbaatar. 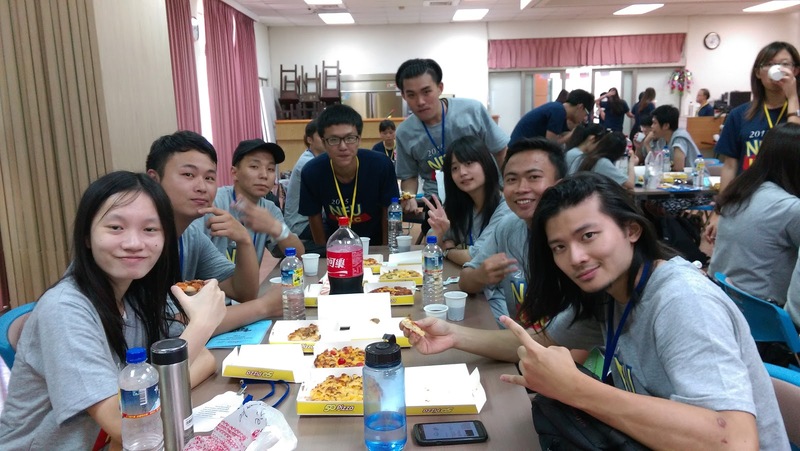 There were 8 teams, each team had two non-Taiwanese student. Dash, May, Sonny, Ching, Sheng are my teammate, the Galaxy Awesome One. Most of the activities on the first day were outdoor field games. So, I didn't have many photos.Until now I still waiting they share the photos on facebook or maybe they would not share it. It started with Opening Ceremony at 09:30 a.m. then the "real activities" began at 10.00 a.m. At the beginning, we had to picked team name. After tough discussion and tie voted between "Galaxy" and "Awesome", we decided "Galaxy Awesome One" as our team name. After lunch we made Aiyu jelly (愛玉冰). It is a jelly made from the gel from the seeds of a variety of fig (Ficus pumila var. awkeotsang). The plant and the jelly were named after the daughter of a Taiwanese tea businessman in the 1800s. The jelling property of the seeds was discovered by the businessman as he drank from a creek in Chiayi. He found a clear yellowish jelly in the water he was drinking and was refreshed upon trying it. Looking above the creek he noticed fruits on hanging vines. The fruits contained seeds that exuded a sticky gel when rubbed. Done with the Jelly, there were another field game. In order to promote the importance of cooperation and interaction, They held some games such as Emergency, Move Your Body Bon't be Shy, Shake It Off, Here Comes The Tornado, Let's Fall in Love, Defend Your Bucket, and Spongebob. The menu for this day are Happy Chinese Time, Dancing Good Good and Nigh Market. In the Happy Chinese Time they taught Taiwanese daily words, tongue twister, and how to write calligraphy. After lunch we had about one hour to practice our dance. This was a super fast track dance course. I think all the Taiwanese really good at dance. Especially the Teaching Assistant (TA) student in this activities. I think they born soft and supple. Their move almost perfect! The night market is special culture in Taiwan. There are many vendors or food and games in night markets. Night markets in Taiwan are street markets in Taiwan that operate in urban or suburban areas. They are similar to those in areas inhabited by ethnic Han, such as Southeast Asia. Night markets in Taiwan have become famous for their xiaochi, an important category of Chinese food which literally translates to "small eats". Served in portions similar to Spanish tapas, these dishes are often served as carry-out items, but many sellers provide small folding tables and stools for customers who would like to sit while they eat. These dishes are offered at low prices, usually around $30 to $50 NTD (≈$1–$1.75 USD). Visitors who expect to eat enough to be full during a trip to the night market will usually spend around $100NTD - $300NTD (≈$3–$10 USD). Most night markets also have some small restaurants, which provide a number of simple courses that allow people to finish a full meal without having to eat their way through the entire market. In recent years, many of the night markets have become popular tourist destinations among sightseeing foreign travelers. It is common to see many travelers with cameras, snapping photographs amidst the crowds (and of the crowds) within the streets. Some of the night markets, such as the Shilin (at Yuanshan, Taipei) and Shida night markets (next to National Taiwan Normal University) are among the first places that Taiwanese students will bring international students for a cultural experience. In addition to food, night markets feature various forms of entertainment and a lot of shopping. Numerous products for sale include clothes, bags, shoes, trinkets, kitchen items, etc. Some night markets will have areas that are dedicated to certain products such as clothes, which are sold both by street vendors in the 100 to 300 NTD (≈$3–$10 USD) range and in the small storefronts lining the streets usually priced slightly higher in the 300 to 500 NTD range. These shops are often open during the day as well, especially during the afternoon before the evening rush. Carnival-style games are typically available to play for the price of a few coins. The night market in Tamsui is especially well known for featuring traditional carnival games such as balloon shooting, net fish, shooting marbles, and an assortment of mini games that could only have otherwise been seen many years ago.